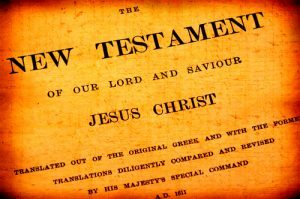 The quick answer is that the New Testament is the second division in the Bible. It is composed of 27 individual books or letters written during the first century AD. It is the portion of the Bible by which Christians seek to live and worship. But the New Testament deserves a better, deeper explanation. Truth is unchanging. If a thing is true today, it is true tomorrow. The words of the New Testament are absolutely true. As Jesus said of his father, “your word is truth” (John 17:17). Some say we live in a post-truth world; they claim truth is no longer relevant. Others assert that truth is whatever is believed. Both ideas are wrong-headed and foolish. Our world cannot function in the absence of truth. We expect the label on our medicines to be true and accurate else we might harm our bodies. How much more important is truth that affects the soul and our eternal life? The implication of a book of truth is profound. Especially a book as the Bible which reaches beyond mankind’s ability to know and test. The premises of salvation are beyond the scientific method. They can neither be known nor examined by the mind of man. They are divine. Yet they are revealed in the New Testament. The apostle Paul declared of his preaching and inspired words, “…we do impart wisdom although it is not a wisdom of this age or the rulers of this age” (1 Corinthians 2:6). Regarding the teachings from God he says, “these things God has revealed through the Spirit” (1 Corinthians 2:10). This Spirit revelation comes through holy, inspired men who composed the New Testament (2 Peter 1:21). Unique and far beyond any comparison to any other book of any time, place or people. 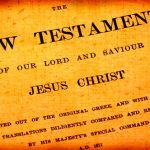 If the New Testament is truth, and it is, and if the New Testament is unique, and it is, the New Testament is the perfect, essential guide to every aspect of our lives. Jesus established his church as he said he would (Matthew 16:13-20). That church began on the first Pentecost (a Sunday) after his resurrection (Acts 2:41). From that point forward, the worship of the new church would be governed by the words of Jesus’ apostles. They had no power within themselves to set or create any doctrine or teaching. What they taught was bound previously in heaven (Matthew 16:19 HCSB, ESV footnote). Therefore, the apostles are conduits, teachers, of truth laid down in heaven. It is this principle, together with inspiration, that accounts for the perfect agreement of the New Testament across over 50 years of composition, almost a dozen authors and a footprint stretching from present day Israel to Italy. Every moment of our worship ought be fully controlled and subject to the words of Scripture.